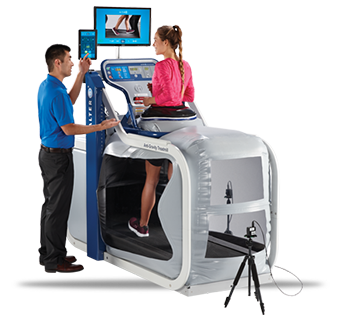 AlterG® Anti-Gravity Treadmills® use innovative Differential Air Pressure (DAP) technology that enables unprecedented partial weight bearing therapy and training capabilities. A pressurised “anti-gravity” chamber counteracts gravitational forces, gently adjusting body weight from 100% down to as low as 20% with unparalleled precision. This uniform lifting force reduces impact, pain, and effort. All while supporting normal gait and balance – and encouraging full, free range of motion and natural movement. The Pro 200 Plus delivers the ultimate experience in training and partial weight bearing rehabilitation for athletes, as demanded by professional sports. With its large chamber, reinforced structure, and high top speeds, the Pro 200 Plus is an elite-level treadmill for athletic training or physical therapy facilities. Features innovative DAP technology. Digital video monitoring system option available. The M/F320 Anti-Gravity Treadmill set the bar in unweighting therapy for PT clinics, rehabilitation facilities, and wellness centers. The M/F320 is ideal for patients recovering from injury or surgery and looking to regain mobility, develop strength and fitness, and increase range of motion and natural movement. The M/F320 is now sold exclusively in markets outside the United States. Reduce gravitational forces to help maintain – or regain -– healthy conditioning. Provide support in a controlled setting for static and dynamic standing practice to work on balance, control, and strength. Limit downtime by enabling training through injuries and return to sport in better condition. Utilize objective data to measure progress and increase motivation. Initiate gradual training programs at rates that set patients up for continued and escalating fitness achievement. Increase exercise volume while minimizing stress-related workload.